Expressive Explorers – using the performing and visual arts to actively engage children in stories. Each workshop is accompanied with resources and a story map to continue exploring the story following our visit. Expressive Explorers workshops are the tailored to enable Early Years involvement in your school’s Artsmark Journey. 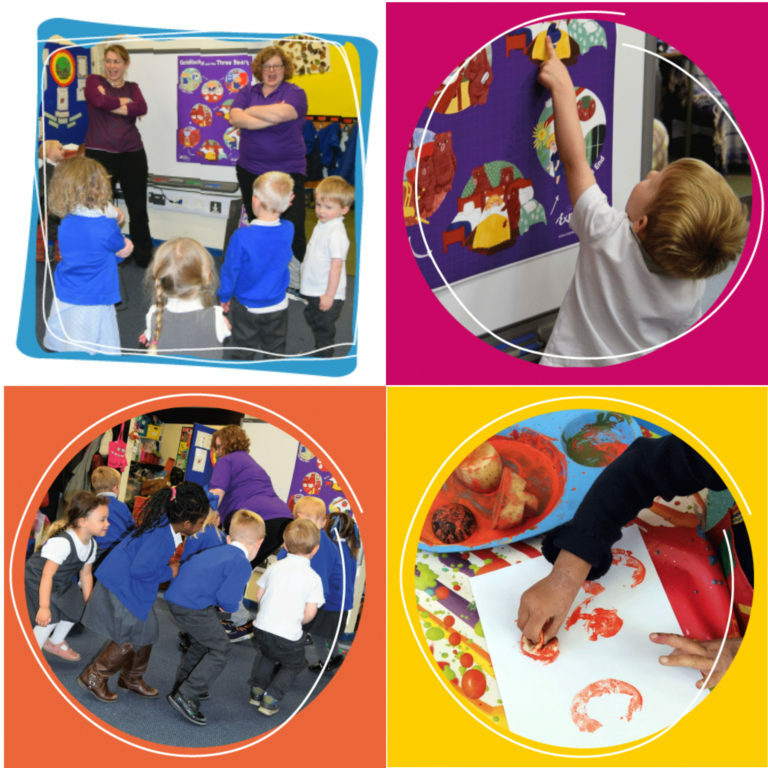 Along with our follow-up printed resource pack and Story Map poster, our delivery provides a hands on CPD opportunity for Early Years Teachers, Nursery Nurses and Teaching Assistants. Giving them new creative ideas to actively engage children in stories through drama, movement, music and the visual arts. Although our resource pack is aimed at the EYFS curriculum, our workshops can also work well in Key Stage 1. Our practitioners are also experienced in working with older children with SEN. Our current stories are based on traditional tales, so there is no need to memorise a long script; the storyteller can use their own words to go with the pictures, or use one of our suggested scripts as a guide. Each story has been carefully chosen to contain repetition so the children can quickly pick it up and anticipate what may happen next. The storyteller can encourage the children to join in by repeating phrases, using actions and playing the different characters. This could also lead to a performance of the story to parents. With repeated storytelling, the children gain more confidence in exploring the different characters, their feelings and emotions. They are able to start retelling the story in their own words, using the Story Map as a guide. If the Story Map is displayed in the role play area, you will often find them acting out scenes from the story. Further information about curriculum links, workshop format and prices can be found here.